The flyer 5.5 SPACEdeck is an astonishingly spacious and uncompromising dayboat carrying 6 people on boardfor a wide variety of programmes. 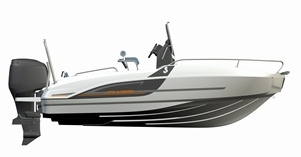 She is easy to transport on a trailer and features lots of options that make this a very personal outboard speedboat. her silhouette is sporty and incisive. She is open with a central console, offering a very clear deck with large walkways for safe and easy movement. Her special V-shaped hull, very narrow at the bow, deflects water perfectly to the rear. An orange line common to all the Flyer SPACEdeck’s is the signature mark of this model. Developed by BENETEAU Powerboat, the Flyer 5.5 SPACEdeck cleverly combines the pleasure of sailing with the practicality of lots of equipment. 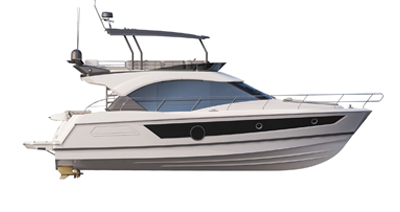 Her hull is equipped with the latest generation of AirStep® ensuring safety and driving sensations. BENETEAU’s partner, Suzuki, offers a wide selection of engines. Extended as far as possible, the deck area allows very easy movement. Safety is further enhanced by high freeboards. The central driving console is compact and protects well. The large aft bench converts into a sun lounger and two large storage areas to bow, making her a very pleasant outboard speedboat to spend time on. For relaxation she has an ice box, hammock, water-skiing mast and Bimini top. Developed in close partnership with Suzuki, the Flyer 5.5 is compatible with up to 140 HP engine power. She has a 135 litre tank (36 US GAL).